Batman leaves behind an amazing legacy that will save the lives of other dogs with Glioma. POST UPDATE: We are very sad to report that on January 18, 2010, Batman, the first dog treated with this new approach to dealing with glioma, passed away as a result of complications from seizures. But, he was still cancer free, and had lived 18 quality months past diagnosis due to his fierce determination and the support of his amazing family and veterinary team. CLICK HERE to visit Batman’s Story of Courage on the Georgia’s Legacy website. The National Canine Cancer Foundation shared this news article about a new treatment option for dogs with brain cancer that has been developed at the University of Minnesota College of Veterinary Medicine. Five dogs have received this treatment so far, and have shown promising results. As a result, the University is now formally opening the clinical trials to other dogs with primary brain tumors. According to their website, “treatment will occur through the canine brain tumor clinical trials program. The trial team currently has funding to treat up to 50 dogs but that number could soon exceed 100 if additional grants and charitable donations come through.” They are actively looking for dogs who may qualify. For more information about the clinical trials, call the UW-Minnesota Small Animal Surgery appointment line at 612-625-8755 or 612-626-8387 or visit their website at www.cvm.umn.edu. Or to donate to support this research effort, contact Sharon Staton, director of advancement, at 612-624-1247, or e-mail her at stato001@umn.edu. Batman, the first dog to undergo a breakthrough experimental treatment for brain cancer, has become a poster dog for the revolutionary therapy. The pointy, black ears of the 10-year-old German shepherd mixed breed dog gave the cancer-surviving superhero his name, but his doctors and a novel therapy gave him back his life. Without treatment, Batman was not expected to survive past Halloween 2008. Given the circumstances, one wonders whether Batman’s doctors, G. Elizabeth Pluhar, D.V.M., Ph.D., and John Ohlfest, Ph.D., aren’t the true superheroes. The University’s dynamic duo developed a combination treatment plan for dogs with glioma, a very aggressive and relatively common form of brain cancer. The treatment, which has given Batman a new lease on life, is now available to other dogs with brain cancer. The three-pronged approach to treatment consists of surgical removal of the tumor, treatment of the surgical site with a form of gene therapy to attract immune cells to destroy remaining tumor cells, and administration of an anti-cancer vaccine made from the dog’s own cancer cells to prevent tumor recurrence. Pluhar, a surgeon at the Veterinary Medical Center, and Ohlfest, head of the neurosurgery gene therapy program at the Masonic Cancer Center, gave Batman his initial treatment in August 2008. Today, the neurological deficits that led to his diagnosis have been almost eliminated. “We documented an anti-tumor immune response that has correlated quite well with tumor regression,” says Ohlfest. In other words, the treatment appears to have worked, and the implications could be far-reaching for both animals and humans. Through funding from government agencies and private foundations, Ohlfest and Pluhar have treated four other dogs for similar tumors. The second dog to receive treatment exhibited an impressive tumor regression following six vaccinations, and Ohlfest and Pluhar are optimistic that the other dogs will show similar responses. Canine brain cancer therapy has been organized within the brain tumor clinical trials program, and the treatment team has funding to treat up to 50 dogs. That number could soon exceed 100 if additional funding is achieved. The cost of therapy for one dog can range from $10,000 to $20,000. However, dogs with tumors that originate within the brain may be eligible for the brain tumor clinical trials program. The program will cover the vast majority of treatment costs while a dog remains in a trial. 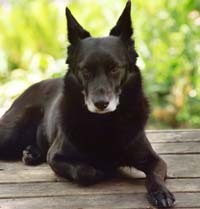 If you or someone you know has been affected by canine cancer, please visit the Georgia’s Legacy website at www.fightcaninecancer.com for information, resources and support to help. This entry was posted in News, Research News and tagged Batman Memorial Fund, brain cancer, cancer research, Cancer Treatments, canine cancer, dog cancer, Dr. John Ohlfest, Dr. Liz Pluhar, Fran Howard, glioma, national canine cancer foundation, University of Minnesota, veterinary clinical trials, veterinary oncology. Bookmark the permalink. Our 12-year-old Border Terrier named Riley is Dr Liz Pluhar’s patient no. 7. She and her team operated on him for a glioma on June 30. He is recovering well, and we have hope for him now that we could not have imagined a month ago. There are many lessons in this for us, but I think one of the most important is IF YOU HAVE AN OLDER DOG THAT SUDDENLY STARTS SEIZING OR OTHER UNACCOUNTED BEHAVIOR, SUSPECT A BRAIN TUMOR. Riley had an MRI which showed without a doubt what was going on. We think Dr Pluhar and her team are TOPS! Again we have a treatmernt that is not going to be available to 99% of dog owners. I had to comment on the lack of enthusiasm in my case for your announcement. My heart aches still for the passing of my Scottish Terrier just a few months ago from cancer. I would like to remind the public of how your pets provide an important part of you daily life- they are a “drug” that has no price. In saying this there needs to be a way to make these treatments available to the common man for his best friend, please make it happen. You’re absolutely right that not enough progress has been made in this field yet, and our pups are still dying from cancer way too often. Hopefully as more pet owners raise awareness of how many pets are affected by this horrible disease and push for more research to find new treatments, pet guardians like us won’t have to suffer the same heartbreak someday. The implications of this work are absolutely huge. I have lost three close friends (people) to brain cancer — if they were going through it right now I would probably want to send them to the U. Minnesota Vet School! We do not know where the knowledge resulting from this work will wind up. We live in a culture that is better able to take care of, and appreciate, animals than many others. I recently spent a month in a South American country that depends heavily on horses, and I met a farrier there who told me that proper horse shoes could double the lives of most horses in the country. What chance does a poor dog have . . . so we are extremely lucky, in a very selective way. I wish our human and animal health care were both not so full of unfairnesses and outrages. You’re so right. It’s so easy to get frustrated at how slowly progress has been made in the field of cancer treatments, and yet, we are very blessed and our dogs (and we ourselves!) have a much better chance of surviving than ever before. It doesn’t mean there isn’t always room for improvements, but I do feel fortunate that our culture is able to value companion animals so highly and spend so much time, energy and money on meeting their needs. It really is a privilege that we have and don’t often appreciate. Thanks for the reminder. Is there a way to get your dog into this treatment trial? Hi Danielle — I would first try to contact the University of Minnesota directly by contacting Sharon Staton, director of advancement, at 612-624-1247, or e-mail her at stato001@umn.edu. If you don’t have luck going that direction, contact Gary Nice at the National Canine Cancer foundation at 866-262-0542. Good luck! I am sad to report that Batman is no longer with us. However, he lived cancer free for 18 months and the cancer did not return. He died of organ complications following a massive seizure (removing the tumor did not stop the recurring seizures it initially caused). Please take a moment to visit http://www.macalester.edu/~abrailov/batman.html and read more about Batman’s story of survival. I just wanted to thank you and your family for all this helpful information. We are currently waiting for our dog “Lucy” to be accepted for the trial. Our vet is sending MRI’s and records. If you had not had the courage and willingness with Batman we may not have known about this. Best wishes to you and your family as I know how it feels to have a sick family member that needs help.